To begin shopping, please select from one of the following categories: In-Stock or Special Order. For quick delivery of our products, we suggest you shop our In-Stock collection. Our complete Home Goods pottery line is available in the Special Order section. Select a pattern and allow 4 to 6 weeks for delivery. 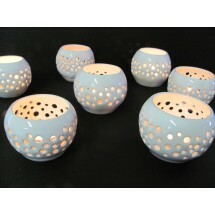 Use these to add a magical touch to dinner tables, dining al fresco in the summer, or to set a ro..